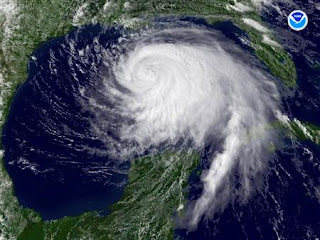 While it is appropriate today to spend as much time as possible in reflection and thoughts on what happened seven years ago over Shanksville, PA, at the Pentagon and in New York City, it is also important to note a disaster pending in the Gulf of Mexico. Ike is on the way. I emailed a colleague from work who lives in Houston. He is far enough inland that he is staying put. This will be his sixth hurricane. I also have an uncle who lives in Houston. I am waiting for a call from my mom to see if she has heard anything. Meteorologist Anthony Watts is keeping the track up on his site. I am anticipating a good scientific discussion at his site regarding Ike- his site is one of the best there is on all things weather related. Another place I am monitoring is Blogs of War. John Little, the author, lives near downtown Houston. John is reporting some gas stations being out of fuel . He also reports overflowing parking lots at the local Kroger. I took another quick tour of Houston’s Midtown and the stores and gas stations are nuts. The one above, which I said two hours ago was mobbed and running low, is now completely out of gas. Kroger’s on West Gray, just down the street from me, was mobbed - completely. The huge parking lot was overflowing on to Gray and other nearby streets. As bad as it is now I expect it to be far worse this evening when even more people leave work and start their preparations far later than they should have. I will continue to update as I find out any more information from friends and family in the Houston area. Matt Damon on Gov Palin: Why Care What He Thinks? Link Between Solar Activity and Weather Obscure?